USA Today, in part based on statements from the Mexican Interior Ministry, reported on November 4, 2018, that some 5,000 migrants are making their way through the southern part of that country in various caravans on their way to the United States. In response, the president has promised to send up to 15,000 troops to the border. That is fine, but what will really be needed are immigration judges, asylum officers, and attorneys from U.S. Immigration and Customs Enforcement (ICE). 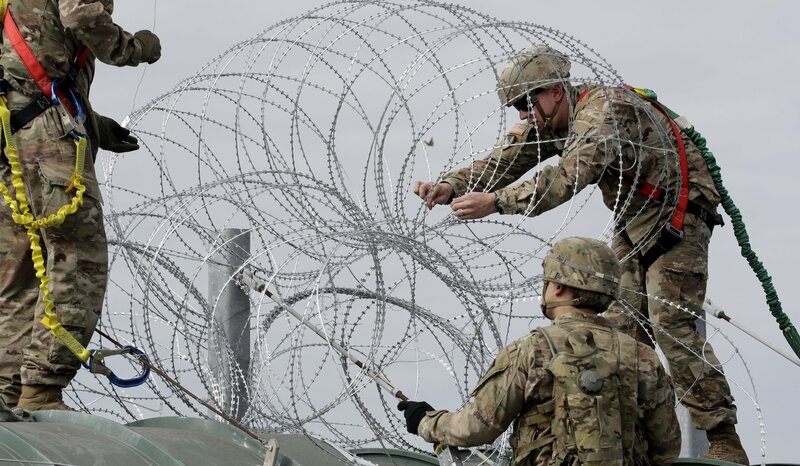 Internal Pentagon documents obtained by The Washington Post indicate that the military specifically wants to highlight the deployment in part to "deter or dissuade the caravan" from continuing toward the United States. So-called "tent cities" will be erected to house those migrants when they arrive in the United States, the BBC reports, and those will likely be set up by the Department of Homeland Security (DHS) in conjunction with the troops who are deployed. The best way to deter future caravans of migrants will be for the administration to quickly screen those migrants who arrive in this caravan. If their purpose in coming to the United States is to live and work in this country (the likely goal of most, if not all of those migrants), then detention, expedited screening for credible fear by asylum officers, and expedited adjudication of the asylum applications filed by those aliens found to have a credible fear that will be key. Given the fact that anywhere between 74 and 90 percent of all aliens screened for credible fear receive a positive determination according to U.S. Citizenship and Immigration Services (USCIS) statistics, large numbers of immigration judges will be needed to hear those cases, and large numbers of ICE attorneys will be needed to represent the government therein. As I have noted in earlier posts, under the Supreme Court's recent decision in Jennings v. Rodriguez and the Immigration and Nationality Act, those aliens should be detained pending a determination on their asylum claims, including any appeals to the Board of Immigration Appeals (BIA). This will require an extended deployment of immigration judges and ICE attorneys, for a number of reasons. First, those aliens will likely be given at least one, if not two opportunities to find an attorney. I expect that large numbers of volunteer attorneys that will head to the border to represent those individuals, but still, matching a migrant with a lawyer will likely take time. Second, asylum cases involving minors and families with minors are generally more complicated than cases involving single male adult aliens, a point that I made in my July 2017 Backgrounder, "The Massive Increase in the Immigration Court Backlog, Its Causes and Solutions". This fact will still be true notwithstanding the attorney general's efforts to clarify the asylum standards as they relate to claims based on private criminal activity in Matter of A-B-. Specifically, I have recently been told that applicants have been converting claims that would otherwise be barred by that decision into claims premised on familial relationships to targeted individuals, such as the parents of males targeted for gang recruitment. The minors in question can then "ride" on the parents' asylum applications. [M]embership in such a group does not necessarily establish a nexus to a ground protected under the Act. Rather, the respondent must demonstrate that the family relationship is at least one central reason for the claimed harm to establish eligibility for asylum on that basis. Such determinations are fact-based, however, and are therefore time-intensive because they require the consideration of significant evidence, both country-conditions evidence as well as applicant testimony and documentation. Immigration judges have been critical, however, of prior reassignments to the border, as Politico reported in September 2017, because, they asserted, they were underutilized. It is critical that the Executive Office for Immigration Review, the Department of Justice (DOJ) component with jurisdiction over the immigration courts, tightly target immigration-court resources to ensure that immigration judges are sent where they are actually needed. This will require intelligence assistance from DOJ, DHS, and (likely) the Department of Defense. The same is true of ICE. For that reason, flexibility in those assignments are key. Given the president's plans, however, such assignments will likely be crucial to responding to caravans, both the one making its way to the border, and any future, similar efforts.